Q: What two things do Uganda, Malta and England have in common? To celebrate the 50th anniversary of the Commonwealth Secretariat, the 85th anniversary of the first Commonwealth Games, and international Commonwealth Day (which is today), the Ottawa branch of the Royal Commonwealth Society (RCS) held its inaugural Taste of the Commonwealth event on Sunday, March 8, at City Hall's Jean Pigott Place. While there weren't any Ugandan, Maltese or English wines to be had (more's the pity) there were plenty from Australia, South Africa, New Zealand and Canada. Guests wandered from booth to booth, enjoying regional delicacies like Jamaican patties and Indian pakora bhaji brought in from local embassies while they sipped and savoured. But Carone stole the show with a full line-up of whites, rosés and reds. The first in the province to plant and make wine from pinot noir, sangiovese and cabernet severnyi, Carone is a pioneer in Quebec winemaking. It also crafts award-winning wines from regional, cold-hardy hybrids. The 'Double Barrel' red kept guests coming back for seconds and thirds, but I preferred the complexities of the pinot noir. 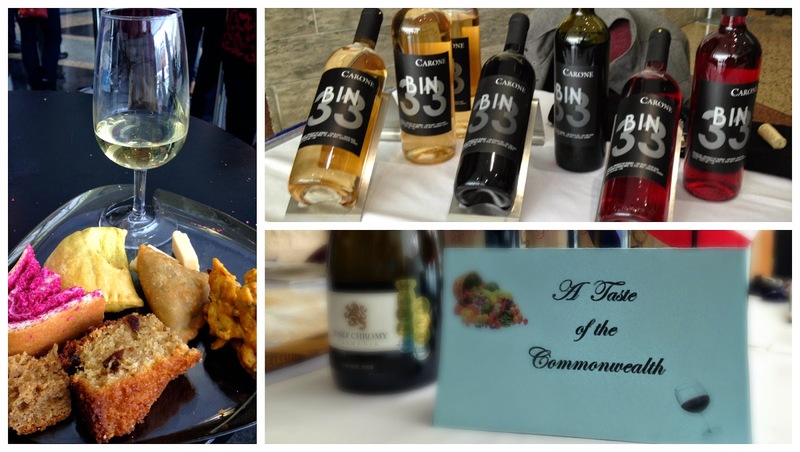 Commonwealth Wine 'Did You Know' ...? The Knights Hospitaller brought centuries of winemaking to Malta and Cyprus. As both countries are islands, they survived the phylloxera outbreak that decimated most of the world's vineyards in the late 19th century. Their native grapes are Girgentina (Malta) and Mavro (Cyprus). Ugandan wine is made from hibiscus flowers; in Nigeria, it's made from pineapples or palm sap. Some Caribbean islands also make wine from the region's abundant supply of tropical fruits. India has the highest growth of wine consumption in the world, and Chateau Indage was the country's first commercial winery. Boschendal 2013 '1685' Chardonnay (South Africa) - Heavy oak presence, with accompanying notes of cedar and muted citrus. Intense buttery, weighty body, with just enough acidity to keep it stable. Three Stones 2014 Sauvignon Blanc (Wairn Valley, Marlborough, New Zealand) - Eye-catching brilliance in this almost colourless pour, with a mere tinge of silvery-green. Sharp nose of grapefruit, citrus peel, grass and flint. Light-bodied, with bracing zest and tart lemon-lime flavours. Long, mineral finish. Creekside 2013 Sauvignon Blanc (Niagara) - Same unblemished clarity as its New Zealand counterpart, but appears more silvered in the glass. The classic aromas are present, but restrained. Instead of being punched in the mouth with acidity, it creeps up slowly on the palate, letting the minerality and citrus notes have their moment first. Finishes ever-so-slightly sweet; overall, a softer, more nuanced version of sauvignon blanc. Carone 2012 Bin 33 Rouge (Lanaudière, Quebec) - 100% Frontenac, which has a history of being horribly misrepresented in the province. The Rouge is all smoke, licorice and black cherry; full and juicy on the palate, with grippy tannins and a dry finish, comparable to chianti. Carone 2012 Venice Pinot Noir - Up-front aromas of brandy, currants and blackberries; the fruit follows through, accompanied by a lovely blend of baking spices and a raisined/stewed flavour profile. The finish is supple and elegant. Carone 2011 Double Barrel - Cabernet severnyi and sangiovese, aged for 12 months in new American oak, then for four more months in spent French barrels. Deep, opaque purple in the glass, with a ruby rim. Complex nose of peppercorns, cloves, cassis and fresh herbs leads into bold fruit and spice on the palate. This is a massive, muscular wine with oomph that would pair well with game meats or any viande saignante (rare meat). From Frank H. Scheme, Photographer: Read it for a second time and really enjoyed your write-up, Bethany. You have a gift for making us want to read more and to go and purchase a few of those wines!